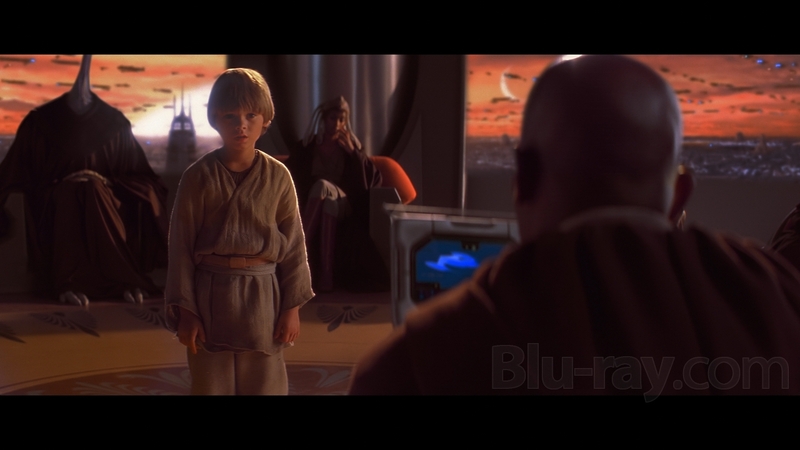 “While all three prequels are known for embracing digital technology, only episodes II and III were actually shot digitally. Episode I was still filmed on 35mm, giving it an inherently different look than its all-digital brethren. Episode I should have a film-like grain structure similar to the Original Trilogy, but for this Blu-Ray release, George Lucas decided to give the film some digital touch-ups to bring it more in line with the other Prequels. Not a bad idea in theory, I suppose, but in practice, that involves copious, noticeable amounts of Digital Noise Reduction – DNR – a process that removes grain from the image. In a film print, grain provides the ‘building blocks’ of the image – you can think of each piece of grain as one particle of the picture. Removing it in excess therefore scrubs away detail – scrubs away parts of the image itself – which is exactly what’s been done here. Everything I wrote then remains true for the film’s 3D re-release, but all the flaws listed above are dramatically heightened when projected on a large theatre screen. As I said, the DNR isn’t necessarily egregious on home video, but blown up to theatrical size, it’s almost horrifying to look at. There’s absolutely no fine detail left in the image; hair, grass, sand, moisture – all of it now blends together in a waxy blur, and facial features have more or less disappeared. Obi-Wan’s face, for instance, is so smoothed out and orange-tinted that it no longer looks human. 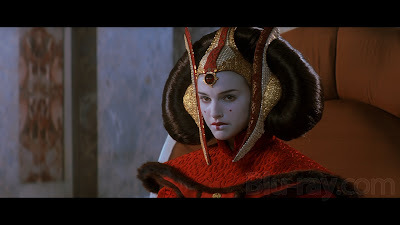 On the Blu-Ray, certain environments, like Coruscant or the Naboo palace, still looked breathtakingly lifelike, but the extra digital work required to convert the “Phantom Menace” to 3D has destroyed those last vestiges of detail as well. From start to finish, detail in all forms has vanished or softened significantly and colors are uniformly washed out or muted. The film simply looks ugly now. It’s so incredibly over-digitized that it is now impossible to fathom that the image was originally captured on pristine 35mm. In fact, much of the film looks as if it were captured on analog video like an eighties TV series. It isn’t an understatement to say that visually, at least, “The Phantom Menace” has been destroyed. Completely, utterly decimated. Not even the special effects remain pleasing to the eye; they may have been state-of-the-art in 1999, but CGI has come a long way since then, and the theatrical canvas exposes all the flaws in the animation. 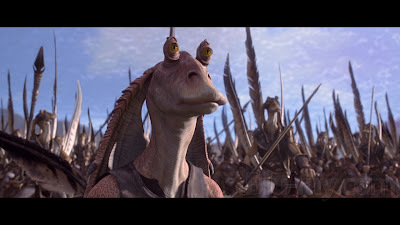 Jar-Jar now looks like a half-finished animatic, and the hundreds of other creatures inhabiting Naboo and Tatooine don’t fare much better. As for the 3D itself, it’s more or less a non-issue. Almost no depth whatsoever is gained via the 3D conversion; the image still looks two-dimensional, save for a few moments here and there. Those moments proved more distracting than invigorating to my eye, since the 3D space simply looks unnatural and fake plastered onto a 2D movie. That being said, the conversion itself isn’t bad. The 3D doesn’t create any (extra) blurriness, it doesn’t noticeably darken the image, and there’s no eyestrain while watching. It’s a competent conversion, and I suspect that had Lucas left the base of the image unaltered by DNR, the 3D effect could have been pretty cool. Scrubbing away all the detail robs the image of its natural depth (all well-shot films have this, whether or not they are made in 3D), meaning the 3D version is, in some respects, more two-dimensional than the 35mm prints seen in 1999. It’s also worth noting that the sound mix in my theatre was extremely disappointing. I’m not ready to blame Lucasfilm for this, since the United Artists at Colorado Mills often screws up their sound system, but the mix was pushed almost entirely to the front with little surround activity and absolutely no low-frequency effects (i.e. subwoofer), making the entire experience that much more underwhelming. The 6.1 DTS track on the Blu-Ray sounded fantastic, so I don’t believe this was Lucasfilm’s fault, but given how terrible the image looks, it’s entirely possible George and company cut corners on sound as well. In any case, no self-respecting filmgoer should pay one cent to see “The Phantom Menace” in 3D. It’s a complete and utter rip-off, akin to projecting a DVD – or, in some moments, a VHS tape – onto a theatre screen. An image this poor simply doesn’t belong there, especially with heightened 3D ticket prices. Since the next two Star Wars films were actually shot digitally, I suspect they will look just fine when they hit screens in 2013 and 2014, but I do fear for the original trilogy if this re-release series make it that far. I myself am content to stick with my Blu-Ray set for the foreseeable future. I would like to see Star Wars in theatres, of course, but if this is how Lucas is going to present his beloved franchise, then count me out. 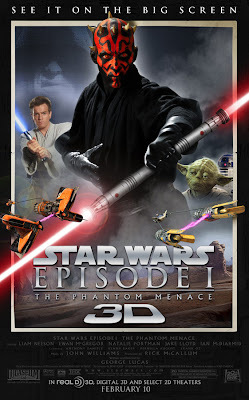 I was disappointed to miss Phantom Menace 3D in cinemas, but not after reading that! Very informative, thanks.